A staple part of any kids life until the nineties, comic book annuals were as much a part of British culture as tea and scones. Every year Santa made sure I had at least three in my stocking. 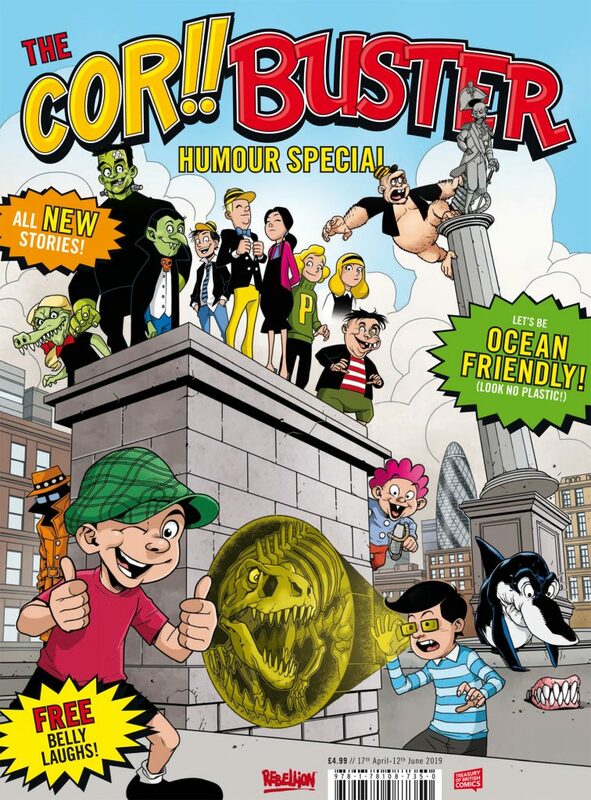 Schoolyard pranks were played out in comic form with overly exaggerated characters in such classics as Beano, Dandy, Topper and our subject matter Cor! and Buster. But with the world changing as it does, some of these beloved characters, suddenly seemed very dated and were forced to become shadows of their former selves. By the noughties, they became just another piece of British nostalgia. But all is not lost as Rebellion are looking to change all that, with the re-launch of a Cor! and Buster special and it was a delight to reacquaint myself with these characters again. Mike Lacey’s creation X Ray Specs? Yep he’s here, and as if to hit the point home of how modern the book is, mentions Playstation in the first couple of frames, while his dad sings Baby Shark. Jaws parody Gumsis back with a slight makeover, but looking better than ever. The great thing about this relaunch is that the stories have been thought about, they are modern, but they are also just as funny as your remember. The infant nightmare Sweeney Toddler looks exactly the same and his antics still involve massive tantrums followed by pungent poos, all accentuated by the over the top artwork of Bash street Kids creator Leo Baxendale. There’s a useful history lesson in the middle, which shows today’s kids just where the characters came from and how they’ve evolved and of course the ever present puzzle page. Yes sir, when you bought a comic book, you got your money’s worth. Once that’s done its back to the chortle, chortle, snigger, snigger of Who’s in Charge? a compilation piece of all your favourite characters from other books like Whizzer and Chips, Smash etc. New entries into the comic world include Hire A Horror, an agency that you can hire monsters from which come in particularly useful, when a man is tortured by, heavy metal band The Ramoaners incessant racket.